What makes a great party for Kentucky Derby? “A” list celebs. OK, but beyond that. Churchill Downs and Woodford Reserve believe they have the answer with their “Bring the Derby Home!” sweepstakes. The recipe for Kentucky Derby fun includes: 40 of your closest friends, catered eats, a full bar, a 47″ flat screen television, Kentucky Derby 2012 party supplies, a natty outfit for the host and party-planning tips. Think about it, no buses, no crowds and if you want to get wild like they do in the infield, all the police will be elsewhere so who will stop you? Also, if you invite a few neighbors, you won’t have to worry about them calling the authorities. And, to be on the safe side, there are taxi vouchers worth up to $250. In a press release Casey Cook Ramage, vice president of brand development and marketing for Churchill Downs, said “Our fans want to experience the Kentucky Derby wherever they are around the world and that’s why we are continuing to fill KentuckyDerbyParty.com full of tasty and traditional recipes from celebrated chefs, sophisticated to chic casual party ideas and a host of favorite Derby drinks to stir and sip.” said Casey Cook Ramage, vice president of brand development and marketing for Churchill Downs. 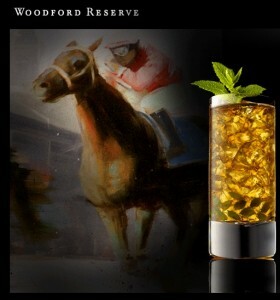 This entry was posted in Kentucky Derby and tagged Kentucky Derby, Woodford Reserve. Bookmark the permalink.